Gloucester lock Dave Attwood will renew hostilities with the Australian Barbarians on Tuesday - less than a week after having two stamping charges dismissed. Attwood was cited for two alleged incidents in last Tuesday's 28-28 draw with the Barbarians, the second of which left opposite number Mitch Chapman requiring up to 17 stitches in his head. Both charges were thrown out by the judicial officer after England successfully argued the citing commissioner should not have been from Australia. Attwood will line up against Chapman again tomorrow at Gosford's Bluetongue Stadium in an England starting team featuring seven personnel changes from the Perth draw. Joe Worsley has replaced Chris Robshaw as captain and blindside flanker while wing David Strettle and centre Dominic Waldouck make their first starts of the tour. Props Jon Golding and Paul Doran-Jones also come into the team while England have switched Dan Ward-Smith from number eight to join Attwood in the second row. James Haskell, who came off the bench in Saturday's Test defeat to the Wallabies, takes over from Ward-Smith in the back row and will pack down alongside Worsley and openside flanker Steffon Armitage. Haskell is the only member of the 22-man Test squad asked to start tomorrow, though Tait is on the bench. Northampton captain Phil Dowson has been included on the bench after joining the squad as an injury replacement for Hendre Fourie. Geoff Parling was not considered due to a neck injury while Ugo Monye is battling a groin problem. Johnson said, "We have made some changes and there is an element of giving guys an opportunity to play so it is not just form related. 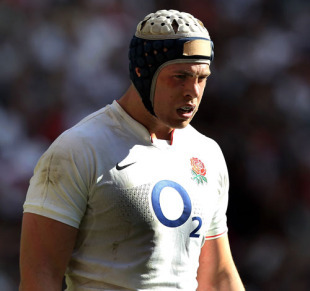 It was always the plan to give guys like Joe and James Haskell a start on this tour, rather than just coming off the bench in Test matches." Johnson admitted he might have a "quiet word" with Attwood in the build-up to the game. After last week's draw and Saturday's Test defeat, England go into the game chasing their first win of the tour. "Our first game against the Barbarians was similar to the Test. When we did things well we were effective, when we made mistakes we were punished," said Johnson. "Coming off our first two matches we can improve. That team has improved a heck of a lot in training this week. They did a good job in the time they had to get ready for last week but after looking at the game and analysing it the training they have done as been at a higher level." D Armitage (London Irish); D Strettle (Harlequins), D Waldouck (Wasps), O Barkley (Bath), M Banahan (Bath); C Hodgson (Sale Sharks), R Wigglesworth (Sale Sharks); J Golding (Newcastle), L Mears (Bath), P Doran-Jones (Gloucester), D Attwood (Gloucester), D Ward-Smith (Wasps), J Worsley (Wasps, capt), S Armitage (London Irish), J Haskell (Stade Francais). Replacements: R Webber (Wasps), D Flatman (Bath), C Robshaw (Harlequins), P Dowson (Northampton), P Hodgson (London Irish), S Geraghty (Northampton), M Tait (Sale Sharks).